The fourth snake is the non-native Aesculapian Snake, and is only found in two specific parts of the UK. Although considered non-native to the UK there are two well established breeding colonies of Aesculapian Snakes in Great Britain that have been in existence now for over 30 years. 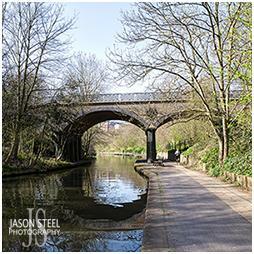 One is in Central London, England and the other is in Colwyn Bay, Wales. 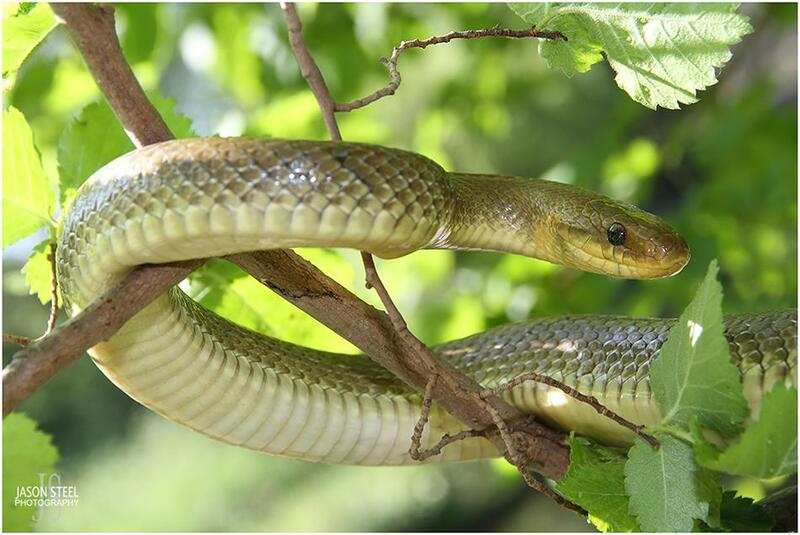 These long slender snakes, of the Colubridae family, are Old World Snakes and one of Europe's longest. They regularly grow to a length of 140-160cm. In warmer parts of Europe they have even reached 225cm. This makes them the longest snake found in the UK. The maximum weight for males is around 890 grams and 550 grams for females. 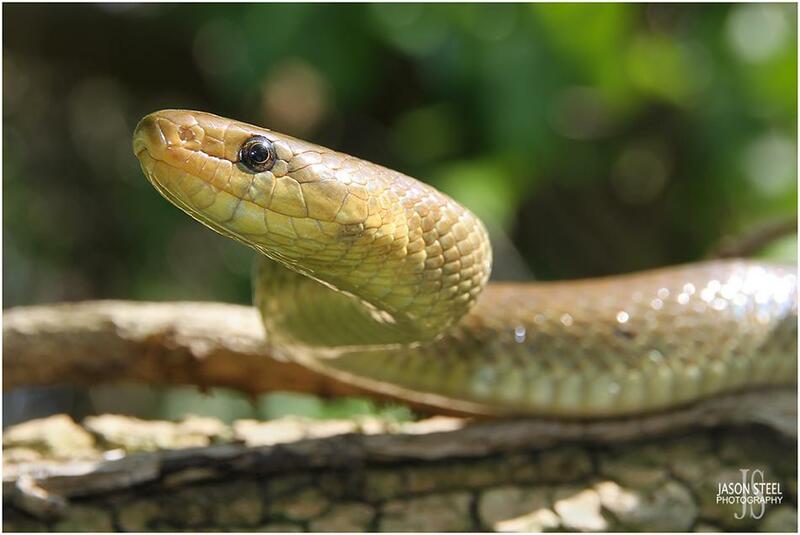 These snakes are usually found across southern, central and eastern Europe and prefer the same method of incubating their eggs as our native Grass Snakes, using warm damp moist areas of rotting vegetation such as hay piles and compost heaps to provide the necessary heat. 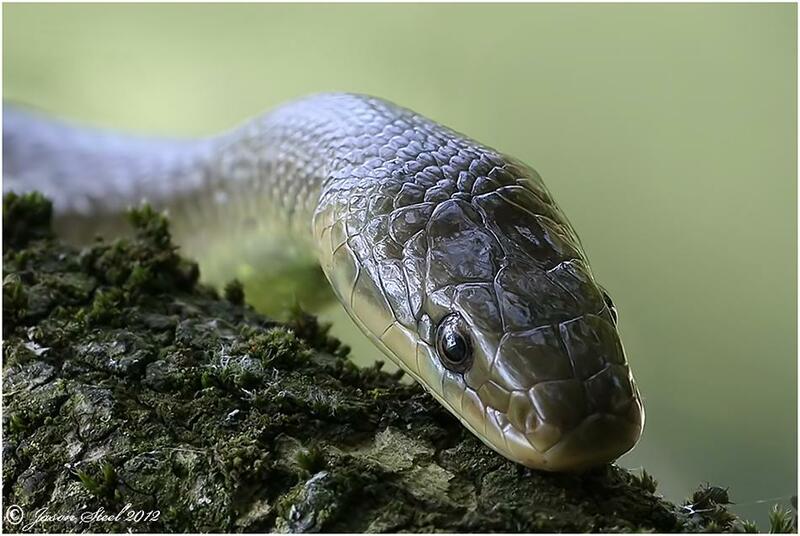 Aesculapian Snakes are semi-arboreal meaning that they are excellent climbers and are equally at home high up in trees and bushes as they are on the ground. They can on occasion be found basking on the canopies of trees and tall bushes, or on roof-tops of buildings. 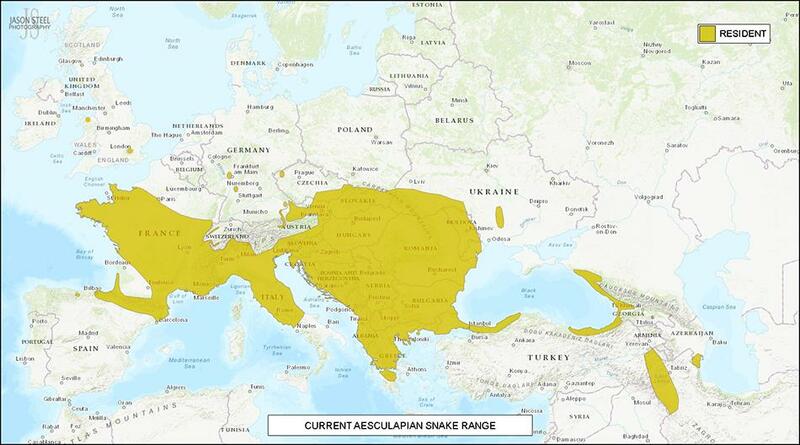 So where did they come from and how did the two separate populations of Aesculapian Snakes end up here in the UK? In 2013 the Welsh population of Aesculapian Snakes was estimated at between 50-100 specimens and came about during the 1960's after a gravid female snake escaped from the Welsh Mountain Zoo at Colwyn Bay and laid her eggs within the grounds of the zoo. The offspring then successfully bred and the population has thrived ever since in and around the zoo grounds. These were first reported by the press during the early '70's. By 2018 the London population of Aesculapians had 50 different adult specimens recorded by Will Atkins and in 2013 this population was then estimated at around 40 specimens. However numbers seem to have fallen significantly in London over recent years. And in 2019 it is now uncertain how many of this once thriving population of snakes now survive. 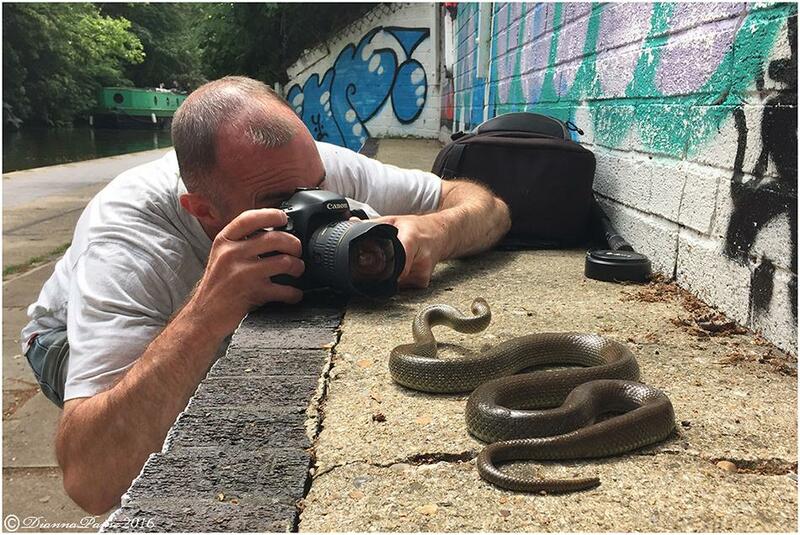 Jason Steel photographing an adult female Aesculapian Snake along Regents Canal in London, UK in 2016. Photo taken by Australian photographer Diane Paine. 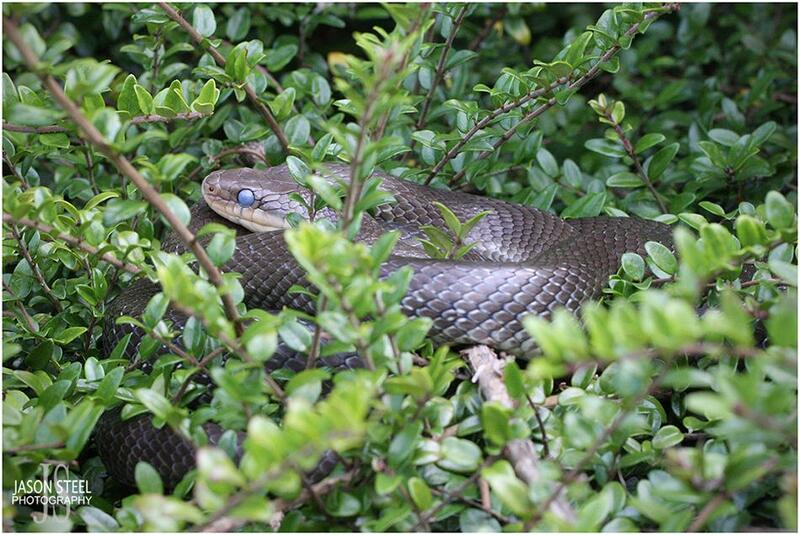 Are these snakes a threat to our native wildlife? The simple answer to this question is no. 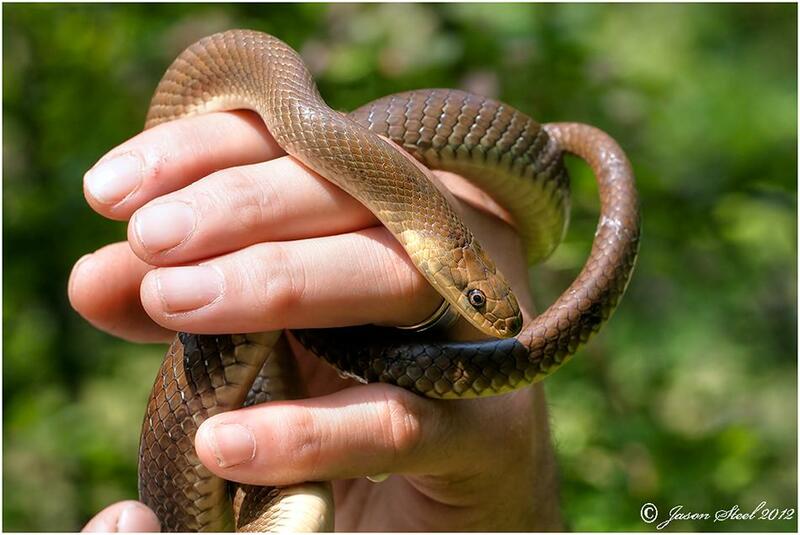 Following ongoing studies of both the Aesculapian Snake populations in the UK by leading herpetologists including Wolfgang Wuster in Bangor, Wales, & Will Atkins in London it has been shown that the existence of these snakes has had very little if any negative impact on our native wildlife. This is largely because they feed almost entirely on common rodents which are in abundance around both zoos. They also seem dependant on woodland habitat connectivity in order to spread. In 50+ years since their arrival neither of the UK populations of these snakes have been able to spread further than the sites where they are found. In London there simply aren't the necessary dispersal corridors available for the Aesculapian Snakes to disperse any further than they already have. And the population's distribution is severely limited by the scarcity of suitable egg-laying sites. No, not at all. The Aesculapian Snake is non-venomous and not an aggressive species and it lacks the size or strength to inflict any harm to either humans or pet cats & dogs. Unless you're a rodent or a small bird, then you're quite safe. 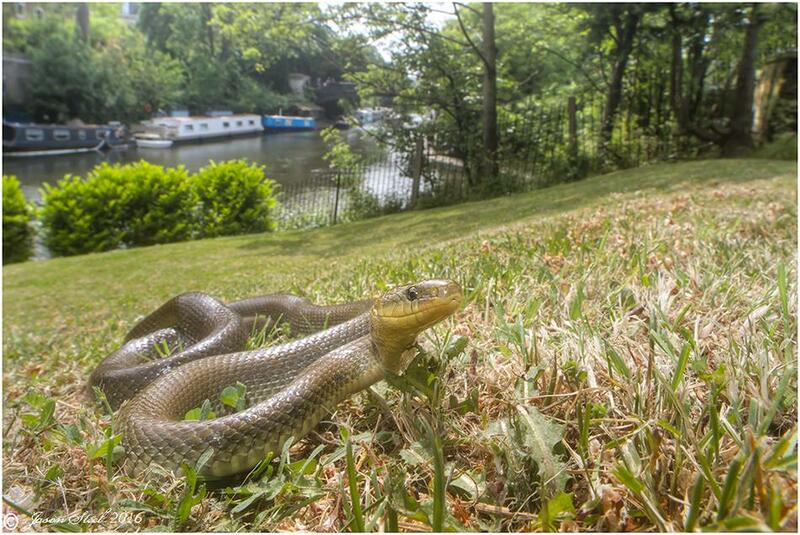 The London population of Aesculapian Snakes can be found along the length of Regent's Canal as it runs past Regent's Park, living on the steeply sloped banks that run parallel to both sides of the canal. 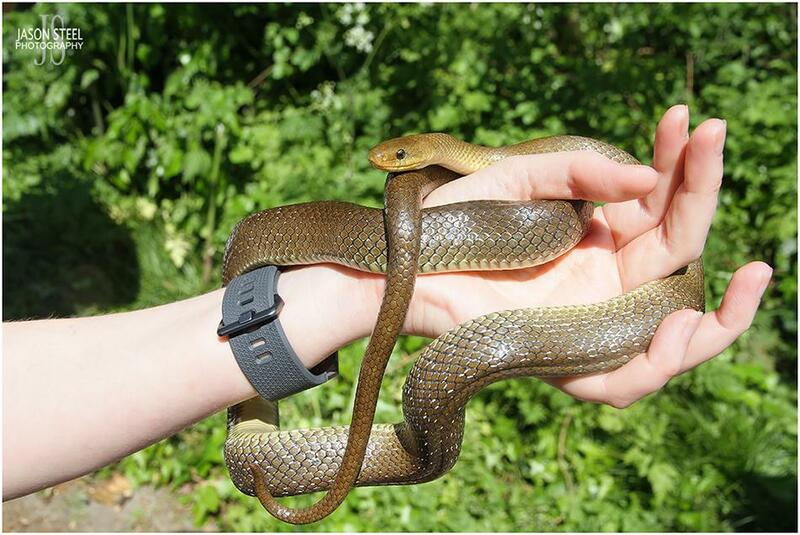 Aesculapian Snake specimens found in London tend to be larger than those in Colwyn Bay and this could be one possible effect of in-breeding by the Welsh snakes, having all derived from a single specimen. These snakes are native to central and eastern Europe and it is believed that the London population may have originated from specimens from the former Yugoslavia (Camden Review) and the Welsh population derived from snakes originating from Central Europe, possibly Italy. However as yet no DNA testing has been done, or results released, to confirm this. Unlike all the other snake species found in Britain, it is the male Aesculapian Snake that is usually larger than the female. The female has greater girth but the male tends to be much longer. The female pictured above had a total body-length of just 3.5ft. A male specimen with equivalent girth would probably have been 5ft+ in length. These elegant snakes range in colour from light golden-brown to dark brown with white flecks and a creamy yellow underside. Aesculapian Snakes have unkeeled scales that are very smooth to the touch and this snake can have a very shiny appearance with an iridescent sheen in bright sunlight. Their overall appearance has been compared to that of a Twix wrapper. This adult female specimen at London exhibits several scars along her body. These may have been caused by attempted predation by birds, foxes, or domestic cats, and some snakes have suffered as a result of encounters with local council workers or groundsmen using strimmers to cut the grass. 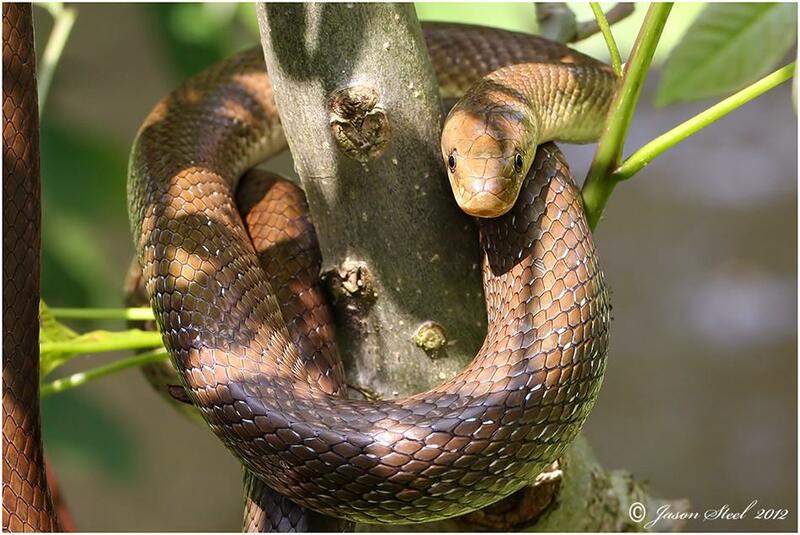 Will Atkins has been photographing and recording individual specimens of the Aesculapian Snake population in London since 2007. His photographic database allows him to identify individual snake specimens by studying unique scale markings on the head of each snake. 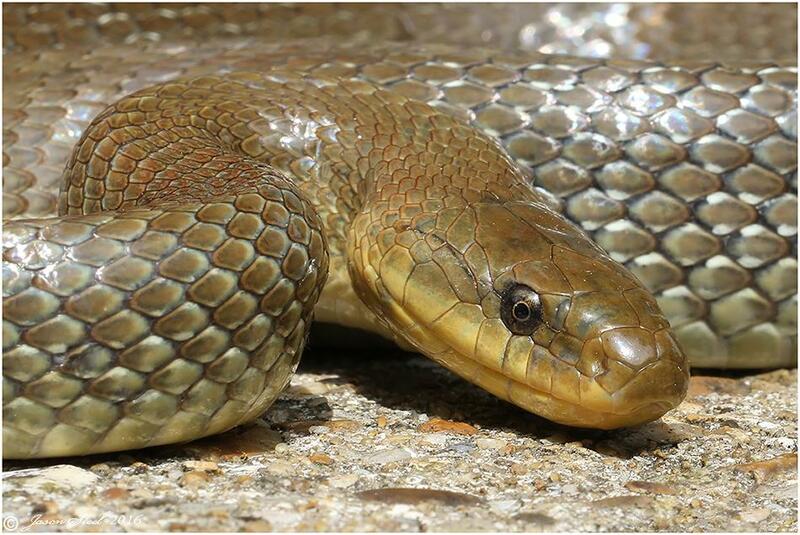 This close-up shot of the snake's head shows the smooth un-keeled scales of the adult female Aesculapian Snake number 15 of the London population, identified from Will Atkin's database. 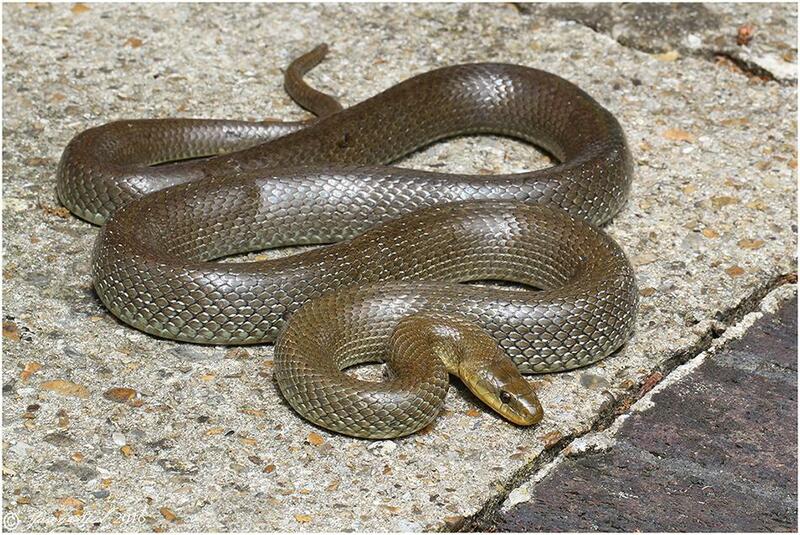 Juvenile Aesculapians usually display a yellow collar making them easy to confuse with juvenile Grass Snakes. However Juvenile Aesculapians can lack the dark collar that is nearly always adjacent to the yellow collar found on Grass Snakes. 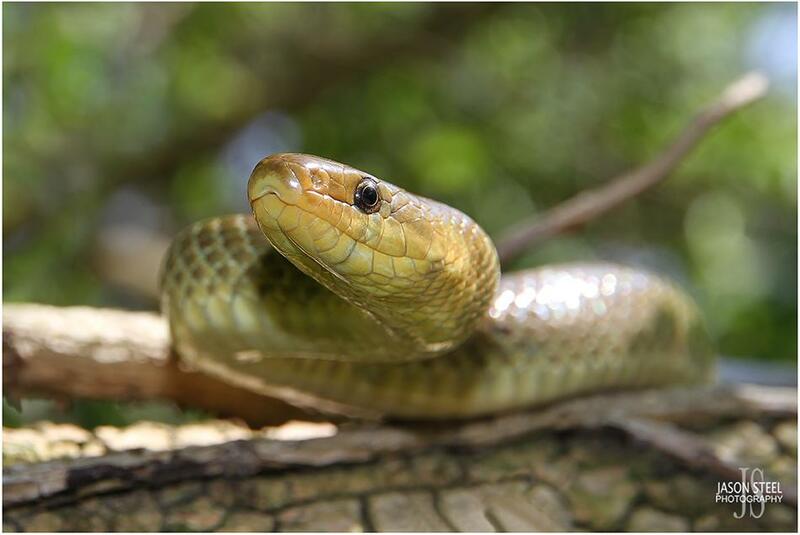 This yellow collar fades and then disappears as the Aesculapian Snake reaches maturity. 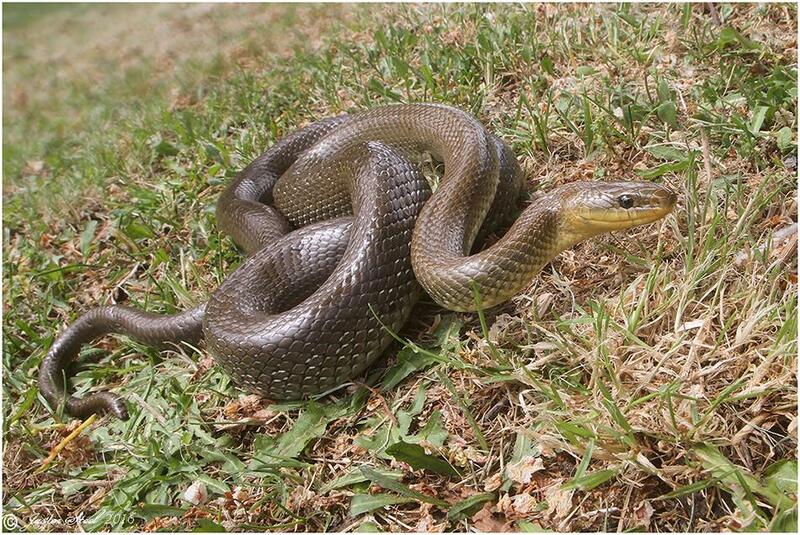 Aesculapian Snakes are egg-laying snakes and usually produce clutches of 5 -20 eggs with 5 -11 being common. These eggs hatch after 6-10 weeks depending on the weather and incubation temperatures. If they can avoid predation Aesculapian Snakes can live for 25 - 30 years and they reach sexual maturity after approximately 4-6 years. Male Aesculapian Snakes reach sexual maturity when they reach around 100cm in length, and females at just 85cm in length. Slithering along the branches of this tree, the Aesculapian Snake is a very competent climber. They use their strong prehensile tail to grasp a firm grip when climbing or when being handled. Adult male Aesculapian Snake with a total length of 4 ft 5 inches, including tail. 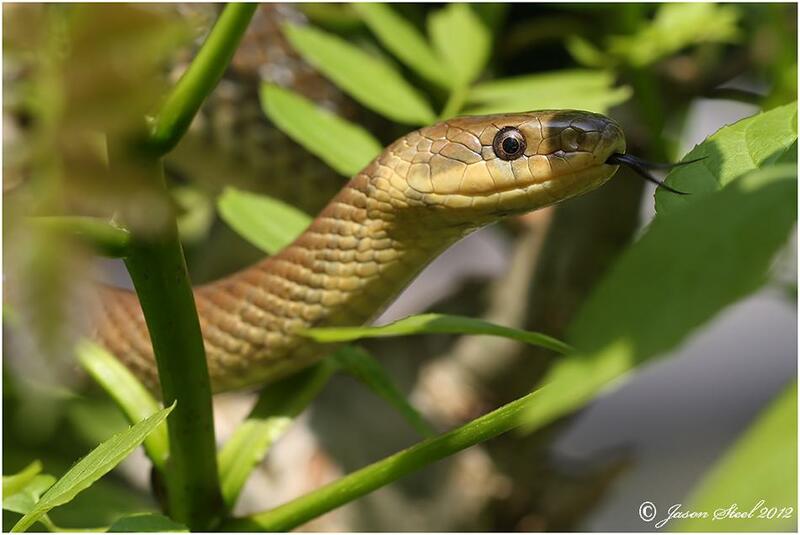 The Aesculapian Snake is not as timid as our native Grass Snake and can often be approached for photographs without disturbing it or causing it to flee. They rely heavily on their excellent camouflage and will often remain completely motionless until they are sure that you have seen them. If handled Aesculapian Snakes may initially bite but usually calm down, and once they no longer perceive you as a threat they can be very relaxed in your hands. Being constrictors, these snakes have a very strong grip. When startled it's surprising how firmly they can squeeze your hand. 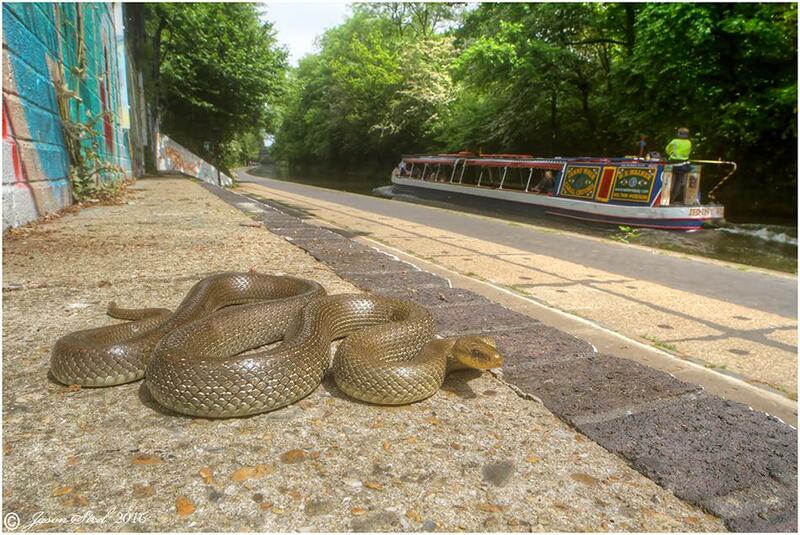 Adult male Aesculapian Snake with a total length of 3.5 ft at Regents Canal 2019. 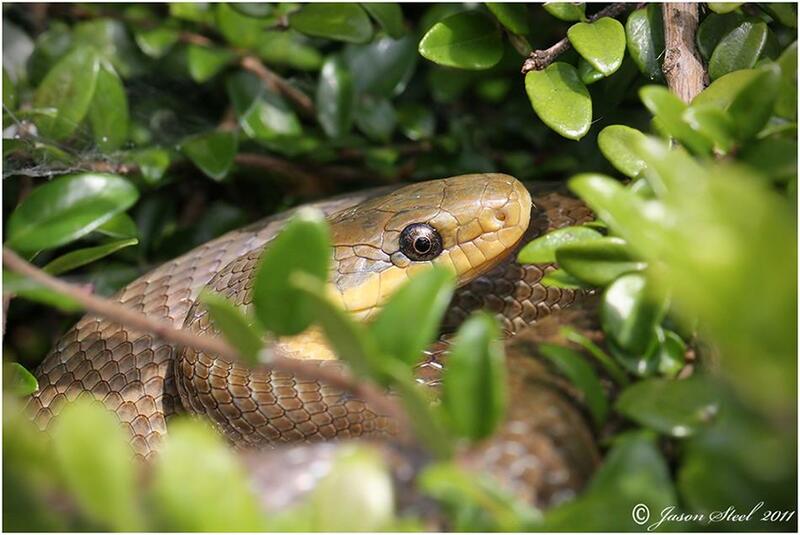 One of two specimens photographed high above the ground basking in the canopy of a large bush at London. 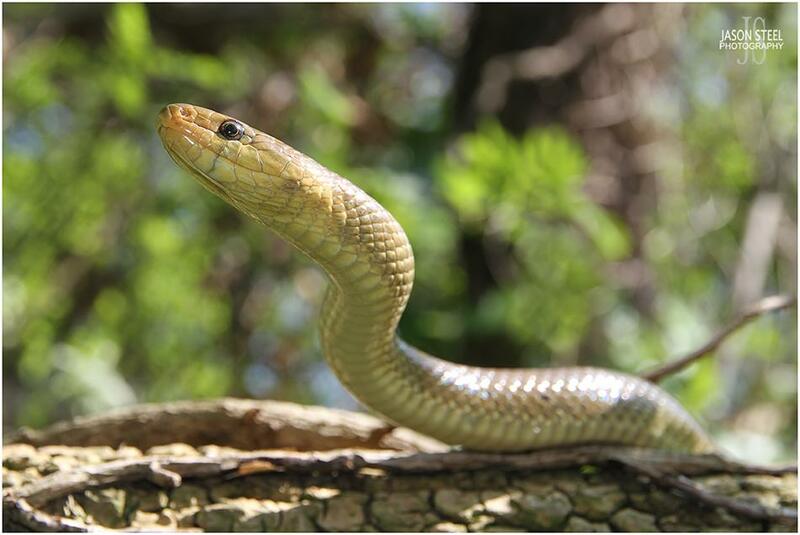 Aesculapian Snakes prefer slightly warmer temperatures to our native snakes and Aesculapians have been observed when temperatures have been between 16 - 25 degrees C, with 21-24 being the favoured range. Feeding mainly on mice, voles, young rats and other small rodents these non-venomous constrictor snakes will also eat lizards, small birds and eggs if available. Like most snakes the Aesculapian Snake sheds its skin periodically in one complete slough. 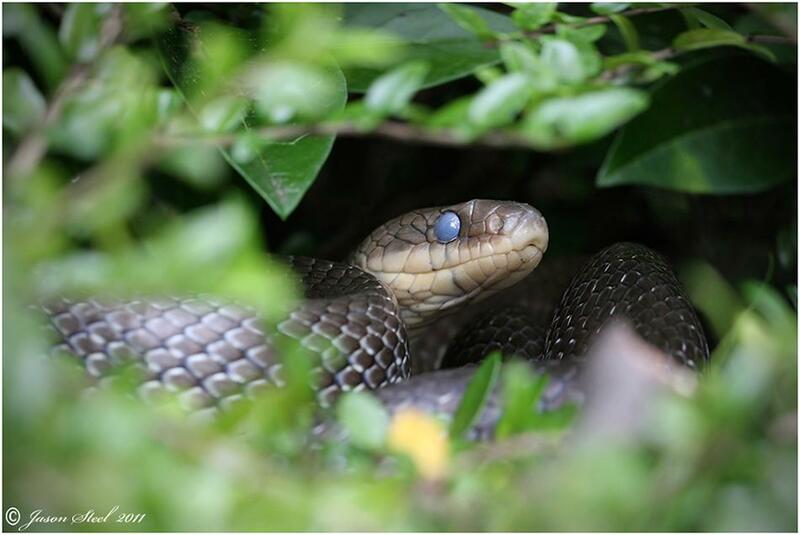 Apart from a noticeable dulling in colour and pattern, one obvious indication that a snake is due to slough is the clouding over and bluing of the scale covering the eyes of the snake as pictured above. This eye-scale will shed first and then the rest of the snake's skin will usually shed a few days later as a complete slough. The second of two specimens photographed high above the ground basking in the canopy of a large bush at London. Members of the public walk past blissfully unaware of the 4ft+ slithering serpents that share this habitat. Photographing this species in public provides an excellent opportunity to talk to curious passersby and educate them about these beautiful creatures and their role in the ecosystem. The reaction from members of the public is usually one of complete surprise followed by fascination. The adult female Aesculapian Snake specimens that I have photographed in London are slightly darker in colour than the males. 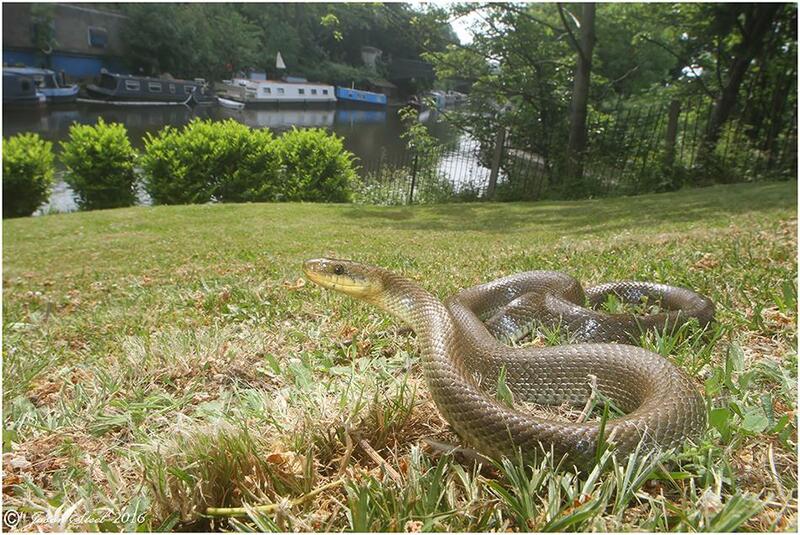 This 4ft adult female Aesculapian Snake was found coiled on top of a log in woodland habitat along Regents Canal. Its entire body was in the shade with just its head exposed to flickering sunlight. Most Aesculapian Snakes do not bite even when handled. Some specimens do hiss and strike when handled but this is often with a closed mouth to serve as a warning. Others may make a strike and bite without doing any harm just to get you to release them. I must stress that there is no chance of being bitten by one of these snakes unless you try and pick one up! They will always flee rather than confront a human. 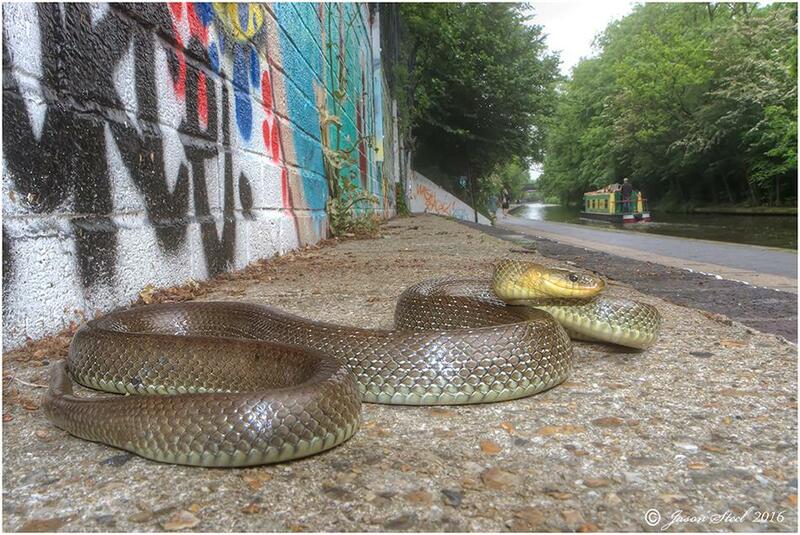 "This snake was found on the canal's edge, mosaic-basking amidst grass and twigs on the ground. 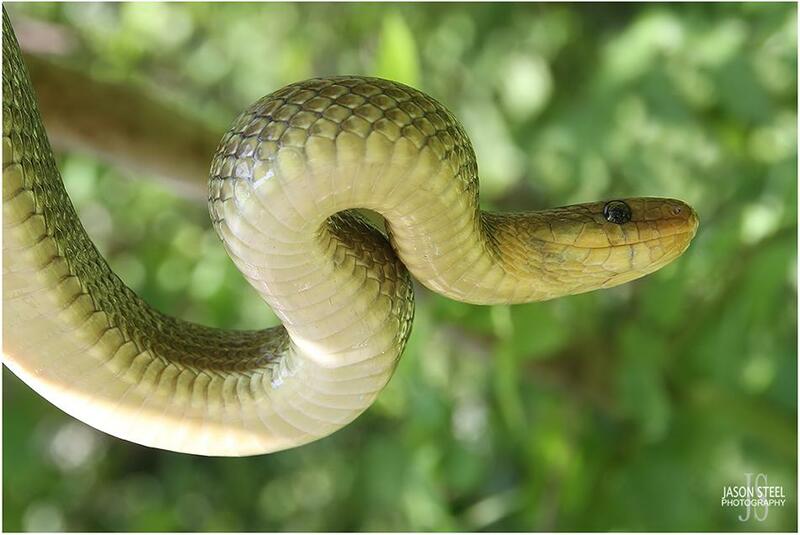 Only a few inches of the scales on the middle of the snake's body were visible, as the rest of the snake was buried beneath the protection of the surrounding foliage. When I carefully picked up the snake to photograph the head for identification purposes, to my complete surprise, an angry, wide-mouthed head quickly spun round and latched onto my wrist. Having never experienced any signs of aggression from Aesculapian Snakes during previous encounters, I was very surprised by how intent this snake was in defending itself from what it perceived to be a potential predator. It wasn't just biting me, It was rotating and twisting its entire body around in my hands whilst continuing to bite my wrist. It really meant business! After about 10 seconds it released the grip that its jaws had on my wrist, and it immediately turned its attention to my hand and began biting again. Then released, and then bit again! Then released, and then bit again! It took me a while to realise that this snake, although drawing blood with every bite, was incapable of inflicting any real pain on me. It had extremely sharp little teeth but lacked the sufficient clamping power in its jaws to do me any real harm. After a few minutes, the snake also came to the same conclusion, and once it also realised that I wasn't actually a threat or causing it any harm it began to calm down. After a while it became quite docile and was content to slither around or just relax in my hands and bask in the sunshine." 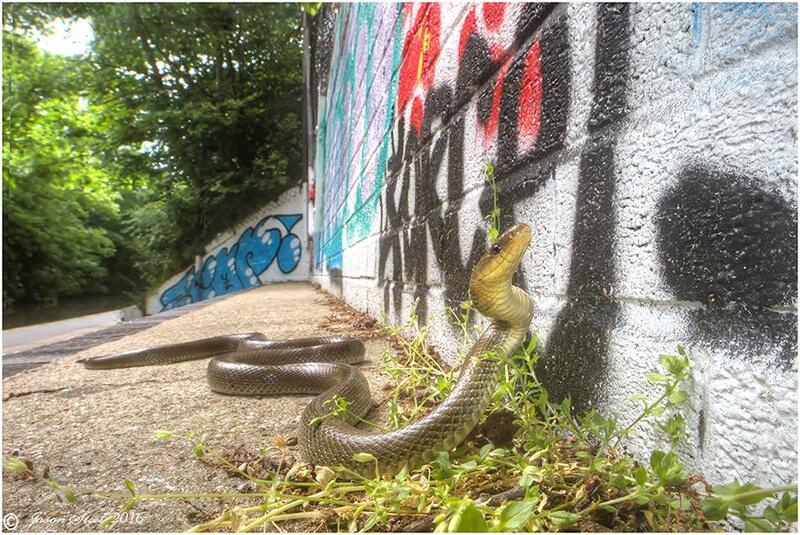 These Aesculapian Snakes living in London have made the news headlines many times over recent years but May 2014 saw a series of disgraceful reports by the British media about the Aesculapian Snake colonies found in the UK. These scaremongering stories were full of false information and inaccurate reports with ridiculous claims and headlines including: "KILLER snakes that are capable of crushing small children to death are on the loose in Britain! " There have been some interesting headlines over the weekend regarding Aesculapian snakes in London, such as the Daily Mirror’s ‘Colony of killer snakes ‘capable of crushing small children to death’ on loose in London’. The London Invasive Species Initiative (LISI) has put together some information which we hope will clear up some inaccuracies. Below is our original statement, in response to a request for information on their population in London. Note that LISI is not calling for the eradication of the species in London, as reported in some media. 'The species of concern list for the Greater London area has been compiled by a range of industry professionals and land managers within London and is reviewed and updated quarterly. This list does indeed include the Aesculapian snakes that are being referred to, although no action that I am aware of has been taken to remove this population, nor does LISI have any plans to do so at present. This species is listed in the Wildlife and Countryside Act 1981 meaning it is illegal to allow the species to spread or escape into the wild. At present there is limited information on what effects the species may have on our local ecosystems and further information would be hugely valuable in developing appropriate management plans for this population’. LISI would require further information and monitoring of this species before advising on any further action. With so many other invasive non-native species having a detrimental effect on our environment, it is not feasible to spend limited resources on a species that does not at present seem to be having a significant impact on our ecosystems. 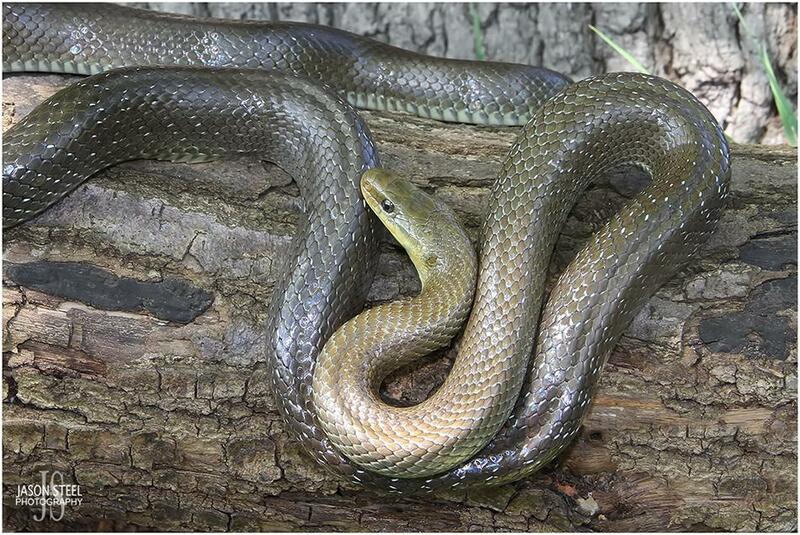 As for the concern about people’s safety, when left alone Aesculapian snakes are a docile and non-venomous species. Please rest assured that your children will not risk being crushed by snakes whilst wandering through central London. 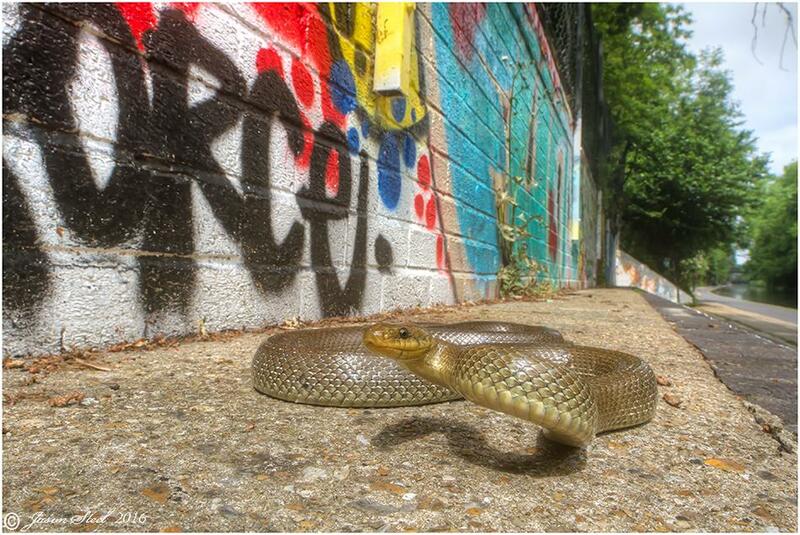 So what does the future hold for the London Aesculapian Snakes? Rather than attempting to remove the snakes from London the action that appears to have been taken from 2016 is to lay high numbers of rodent traps in the areas that these snakes were known to use as feeding grounds. By reducing the available prey for the snakes it has made it harder for them to survive. I also fear that it's possible that some snakes may have been killed by feeding on poisoned rodents. 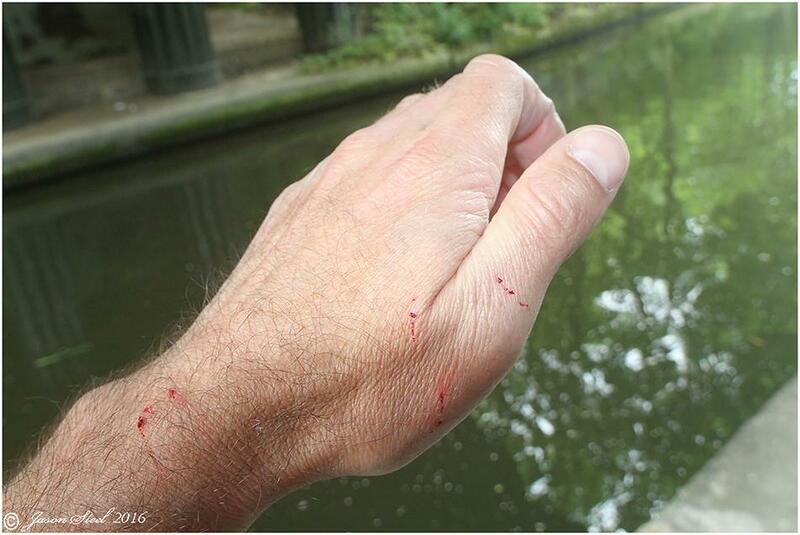 Other snakes have also suffered at the hands of selfish collectors and I have personally witnessed some members on reptile forums boasting of their intent to catch and keep wild specimens from the London Aesculapian Snake population. Numbers may also have fallen due to lack of breeding success and persecution. 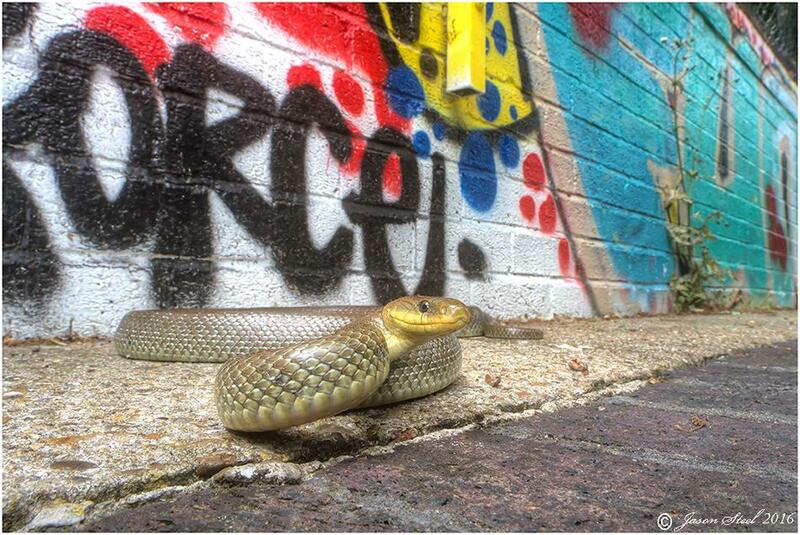 It is now unknown how many of these London Snakes still survive in the wild in London. If you are lucky enough to see one yourself please do get in touch with me as I'd love to hear that they are still clinging on despite all odds. 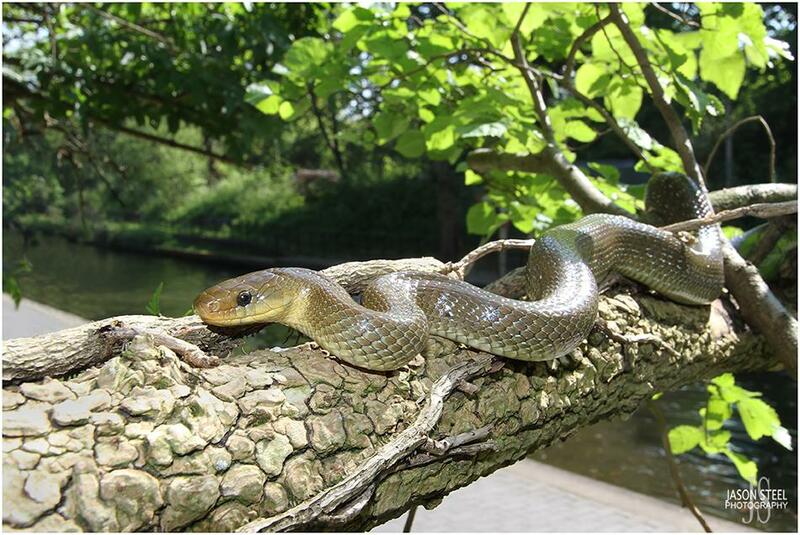 Maybe some of the London Aesculapian Snakes did originate from London Zoo? "Years after the old reptile house had been disused, harmless snakes that had escaped in this way were found in the mill-room underneath the old house. They had doubtless lived upon the rats and mice that swarmed in this place." 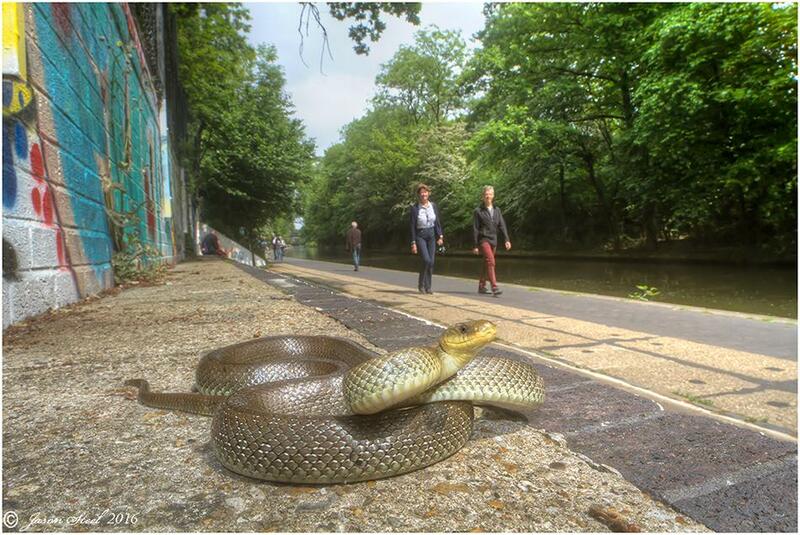 This information could make one question whether there is an unlikely possibility that maybe some of the specimens of Aesculapian Snake still found along Regents Canal could indeed have originated from escapees from ZSL? There have been a few discoveries in the UK of ancient fossil remains of Aesculapian Snake dating back to the warm end of the Pleistocene Period (around 11,700 BC) found in Suffolk and Essex (B.H.S. Bulletin no.50 1994). 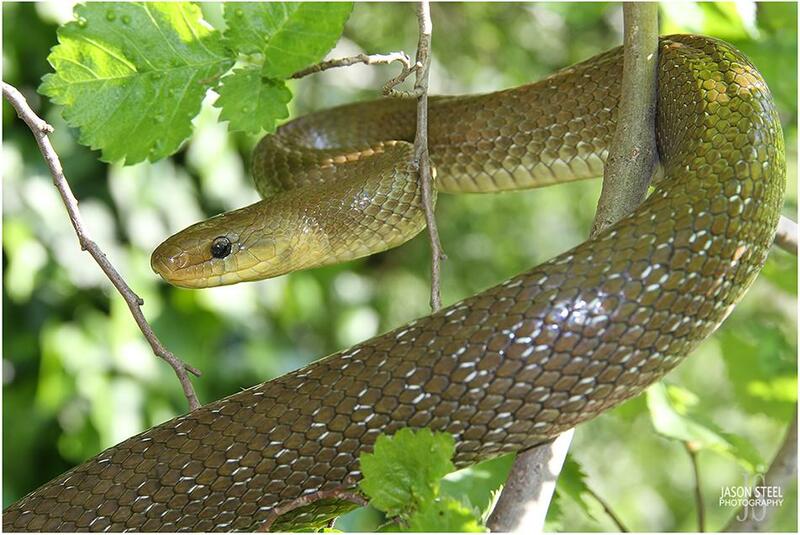 So although now considered a non-indigenous species the Aesculapian Snake may have once been native to the UK after all many years ago when the climate was warmer. This topic is covered in the 1998 book "Pleistocene Amphibians and Reptiles in Britain and Europe" by Professor J. Alan Holman. 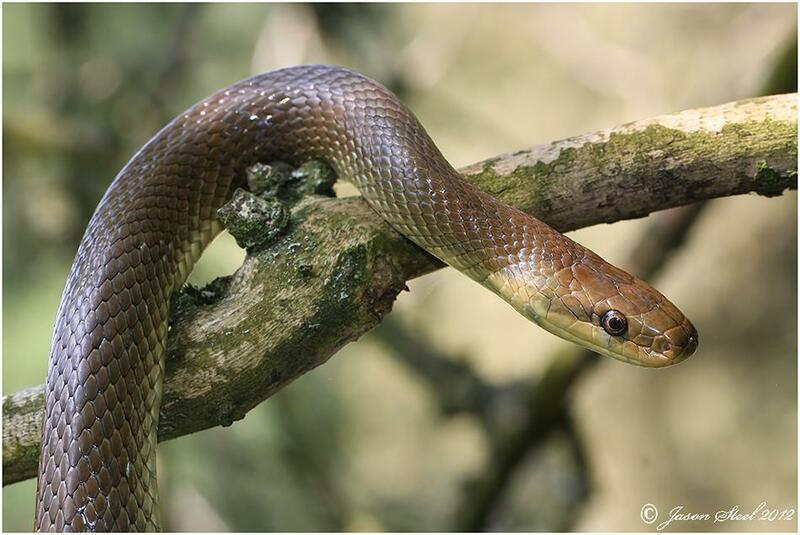 Fossilised remains of Aesculapian Snakes have been found in the UK at these three sites: East Farm, Barnham, Sussex (discovered in 1994) & Beeches Pit, West Stow, Suffolk (TL798719 discovered in 1991) & Cudmore Grove, Essex (discovered in 1990). There is also the possibility that these fossils are the remains of yet more feral populations of Aesculapian Snake that either escaped from captivity or were deliberately released, as both the Greeks and the Romans kept Aesculapian Snakes in temples for healing and fertility rituals. However, the Mycenaean civilisation of early Greece (1600BC - 1100BC) never made direct contact with Britain and the Romans did not come to Britain until 43AD, so this hypothesis is unlikely. Purchase "Pleistocene Amphibians and Reptiles in Britain and Europe" by Professor J. Alan Holman. 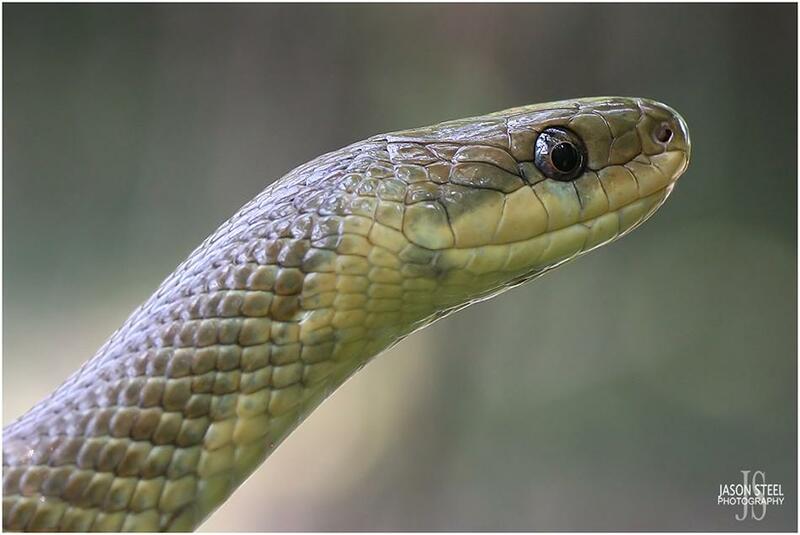 The Aesculapian Snake is one of four species of Rat Snake found in Europe and it is known that their range once reached far further north than it does now when the Earth's climate was warmer. This vast range may have been contributed to by escaped specimens from when the Romans kept Aesculapian Snakes during the Roman occupation of Europe. Where can I find wild Aesculapian Snakes? Aesculapian Snakes get their name from the Greek god Aesculapius / Asclepius, the Greek god of healing / medicine, who was the son of Apollo. Aesculapius was reputed to have mystical healing powers and the ability to transform himself into the harmless Aesculapian Snake. The skin-shedding of the Aesculapian Snake was seen as a symbol for rebirth and renewal. In Greek mythology the god Zeus killed Asclepius with a thunderbolt as a punishment for accepting money in exchange for resurrecting the dead. Once killed, Zeus placed Asclepius among the stars as the constellation Ophiuchus also known as the serpent bearer. Aesculapian Snakes were used in ancient temple ceremonies for healing and sexual virility rituals performed by both the Greeks and the Romans. The Greek god Aesculapius is often depicted holding a snake-entwined staff. This staff became a symbol for healing which is still used in modern medicine today and can often be seen displayed outside pharmacies. 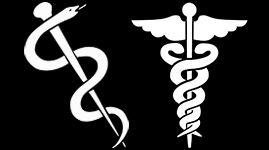 The second symbol is the Caduceus, a short staff entwined by two serpents often surmounted by wings. 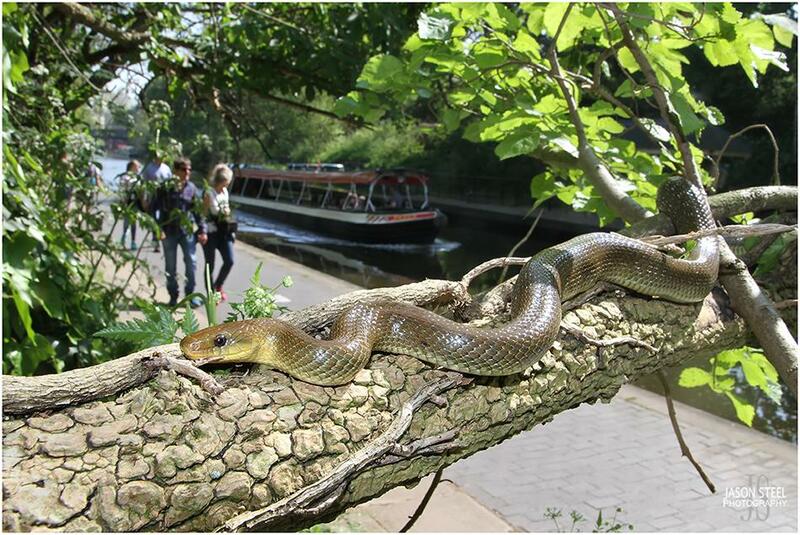 In 2013 an Aesculapian Snake was seen basking along the edge of Regent's Canal by members of the public. It was filmed and shared on YouTube. Lastly, I would like to make an appeal to anyone considering catching and keeping a wild Aesculapian Snake as a pet. PLEASE DON'T! It is an absolute joy being able to find, photograph and watch these beautiful reptiles living wild and free in the UK. They have found a niche in our ecosystem that has allowed them to flourish without upsetting the delicate balance of our environment. There are suspected to be a maximum of 20 breeding pairs in the London population. 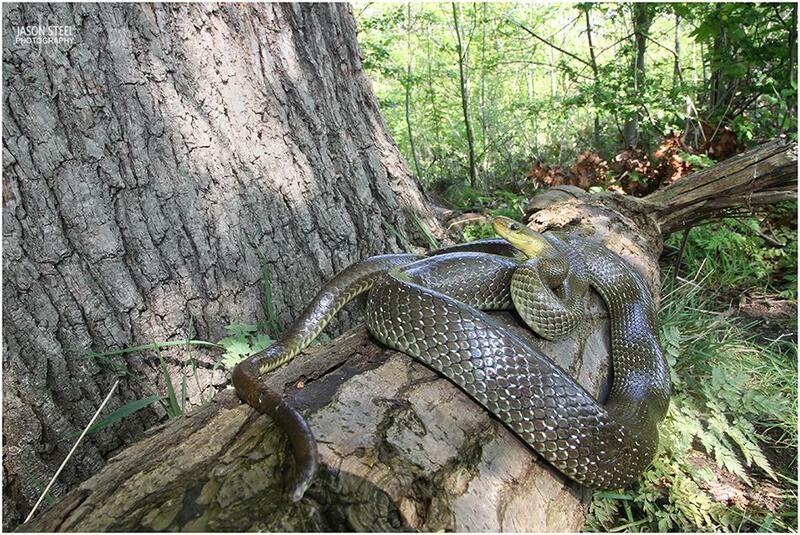 Just removing one snake could have serious consequences for the future of this species in the UK. 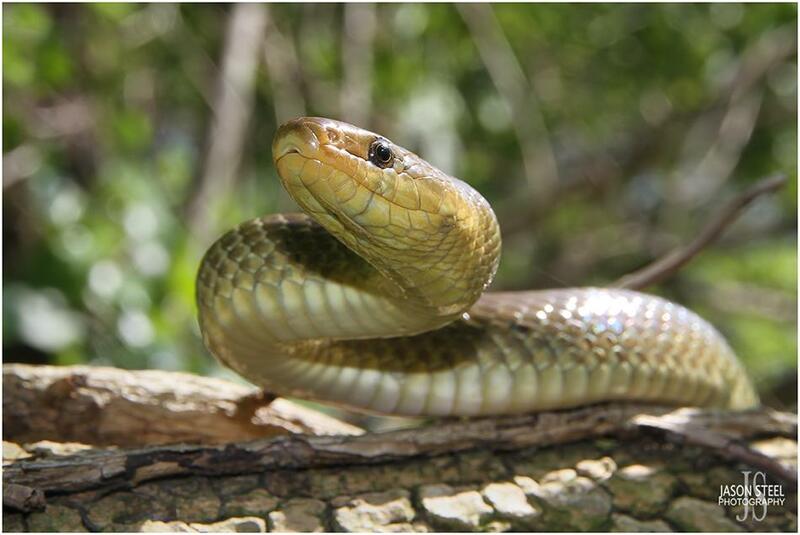 Many of these snakes have already been caught, and with the increasing number of rodent traps being used in the area, these are also likely to have a negative impact on number of these snakes. Please just be grateful if you are lucky enough to see one, let it live in peace in the wild, and let other people also experience the joy of seeing them living wild in the UK. Canon 7D & 40D cameras and the Canon 100mm f/2.8L IS Macro, Canon 15-85mm and Sigma 14mm f/2.8 Wide-Angle lenses.